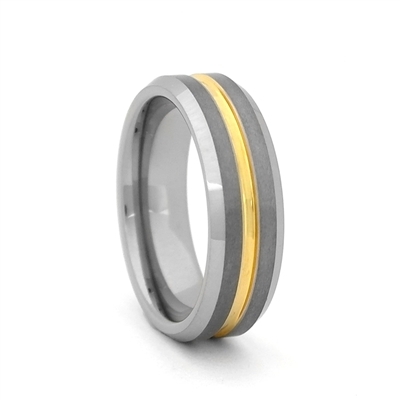 This beautiful 7mm two tone tungsten carbide wedding ring features satin finish with high polish edges. Ring is accented by the gold color PVD coated groove. PVD plating ensures that gold color of the ring last as long as the ring itself. Elegant design and color combination is a perfect choice for everyone who loves to mix and match their jewelry. Match it with SR4G-4mm for a His & Her set.